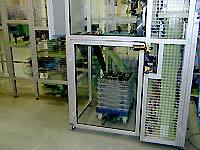 The pallet manipulator takes the pallets from the carriage with the rough parts and brings it into a defined position where the single parts are taken by for example gantry loader from. 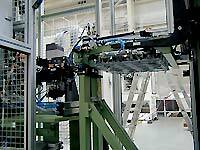 The gantry loader manipulates with parts in the machine. After the pallet is filled with finished parts, it is put on the carriage with finished parts.